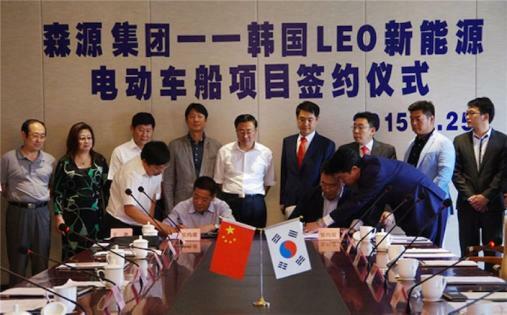 SEOUL, SOUTH KOREA / ACCESSWIRE / August 6, 2015 / Leo Motors Inc. (LEOM) ("LEO") has signed a joint venture agreement with Fushun Jinyuan Technology Machinery Manufacturing Co., Ltd. ("JTY" or "Jinyuan") to set up a Joint Venture Company ("JVC") in Fushun City in Liaoning Province of China to develop, manufacture and sell electric cars for Chinese and international markets. The initial investment of the JVC is 411,600,000 Chinese Yuan or $ 66 million U.S. dollars. LEO's proprietary technologies will be utilized in electric cars manufactured by the JVC, which will be sold to both government offices and private companies in three Northeastern Provinces of China (Liaoning, Jilin and Heilongjiang) encompassing eastern Inner Mongolia, beginning in 2016. China has mandated that by 2016 thirty percent (30%) of all new government vehicle purchases are to be electric powered in order to fight pollution and cut energy use. The mandate is facilitated by an exemption from sales tax. In spite of the central government's mandate, there are very few electric vehicles in three Northeastern Provinces because of the extremely cold winters, at times dropping below -22 degrees F. In such cold temperatures traditional batteries do not function, making electric vehicles useless. LEO has solved the cold region problem with its recently invented electric vehicle battery power pack using Nano Carbon Technology ("CNT") which works and supplies full power in low temperatures (under -22 degrees F) without any capacity or power loss. LEO was invited to participate in this new business venture by the city government of Fushun. Fushun city officers introduced Leo to Jinyuan, the largest private company in Fushun City. Because of their role in facilitating the new venture all important Fushun City officials including the mayor, deputy mayor, and major directors and managers attended the agreement signing ceremony. In the interview with local press at the signing ceremony, Mr. Si Guicheng, the chairman of Jinyuan, stated, "The government projects the demand for electric vehicles from the three Northeastern Provinces exceed one million units including electric buses, garbage trucks, city cleaning trucks, fire engines, and official or public business cars. The JVC is expected to supply 30,000 electric vehicles to the government within the first year of manufacturing as we monopolize the regional electric vehicle market based on LEO's CNT battery power pack technology. Sales are expected to exceed 10 billion Chinese Yuan (approx. $1.67 billion USD) per year." Dr. Shi Chul (Robert) Kang, CEO of Leo stated, "LEO's sales are expected to reach 4 billion Yuan (approx. $643 million USD) annually based on our priority rights to supply power trains including motors, controllers and battery power packs for the electric vehicles manufactured by the JVC." He also said, "From the foundation of our experience in the Northeast China, we will aggressively expand our business into the electric vehicle markets of all extreme cold regions in the world, including Russia, Alaska, Norway, Finland, etc. Our CNT battery power pack is the ultimate marketing edge for electric vehicles in extremely cold regions in the world." It is important to note that LEO will receive ten percent (10%) of the JVC gross profit for ten years as a technology transfer fee. Leo has the exclusive right to market and sell electric vehicles manufactured by the JVT outside China. Dr. Kang added, "We have recently invented additional major new technologies which make electric vehicles more sustainable including an electromagnetic prevention circuit, a handy and low cost battery swap system, a circuit breakage prevention system, cartridge batteries, and 'cloud based' computer-connected electric power trains. These technologies are essential to increase electric vehicles' safety and sustainability in all of the climates and will change the world's concept of electric vehicles versatility and reliability." Leo Motors, Inc., through its subsidiary Leo Motors, Co. Ltd., is engaged in the research and development (R&D) of multiple products, prototypes and conceptualizations based on electric power generation, drive train and storage technologies. Leo Motors, Co. Ltd. operates through four unincorporated divisions: new product research & development (R&D), post R&D development such as product testing; production; and sales. The Company's products include, E-Box electric energy storage system for solar and wind power generation devices; EV components that integrate electric batteries with electric motors such as EV Controllers that use a mini-computer to control torque drive.